The project is a renovation & extension the existing consulting rooms for Knox Orthopaedic Group, adjacent to Knox hospital. The main entry is via the Knox hospital car park, with the rear entry within a residential street. The brief was to extend the existing administration spaces and reception area and add 2 additional consulting rooms. The programme developed includes consulting rooms for the surgeons, with a communal hot desk touch down area for post consultation work. The administration office accommodates the support staff and a large kitchen and outdoor deck allows the team to come together for lunch and post work get togethers. The reception area plays a dual role of waiting area as well as a workshop space for group mindfulness classes, which are an important component of the recovery process for the patients. 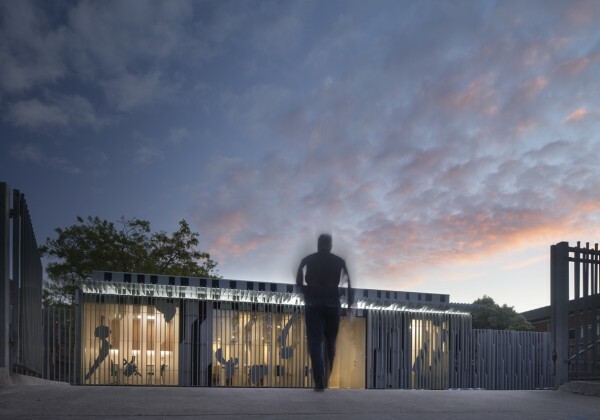 A key consideration was to increase access to natural light and ventilation and develop a visual connection to the new garden areas from the workspaces. 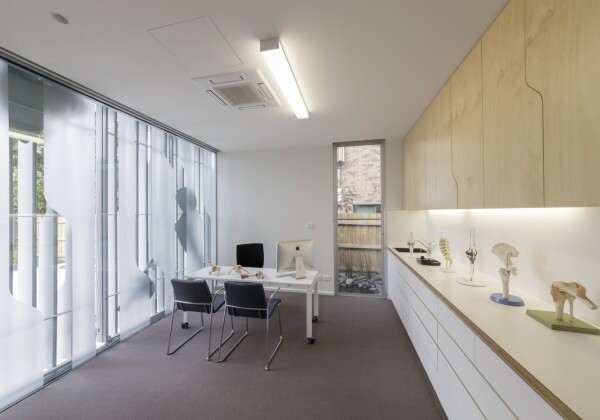 What were originally generally internalised spaces with no connection to the exterior have now become light filled and naturally ventilated spaces, with a significant reduction on the reliance for artificial light and ventilation, and happier and healthier staff.Orthopaedics and architecture have a symbiotic relationship. The tools, process and the language of the orthopaedic surgeon is aligned with the ways of the carpenter. There are also parallels between architectural design and the design of prosthetics and surgical techniques, with 3d modelling and printing a common practice in their R&D processes. 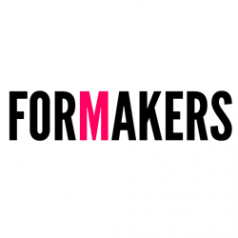 Our design approach was to emphasise the parallels between the disciplines in the built form. 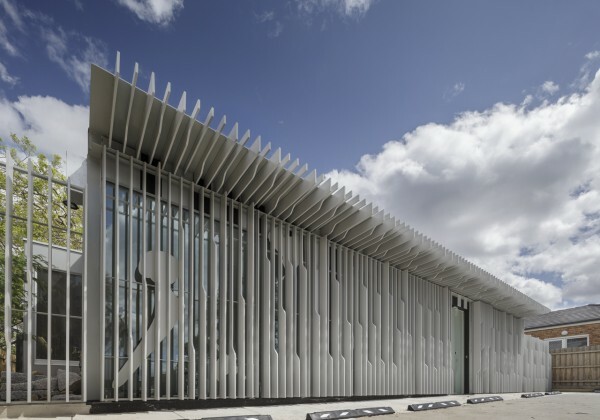 The layered façade references the tools, prosthetics and the human frame.The design creates interplay between the 2 dimensional and 3 dimensional qualities of the X-ray, another essential analytical tool of the surgeon. 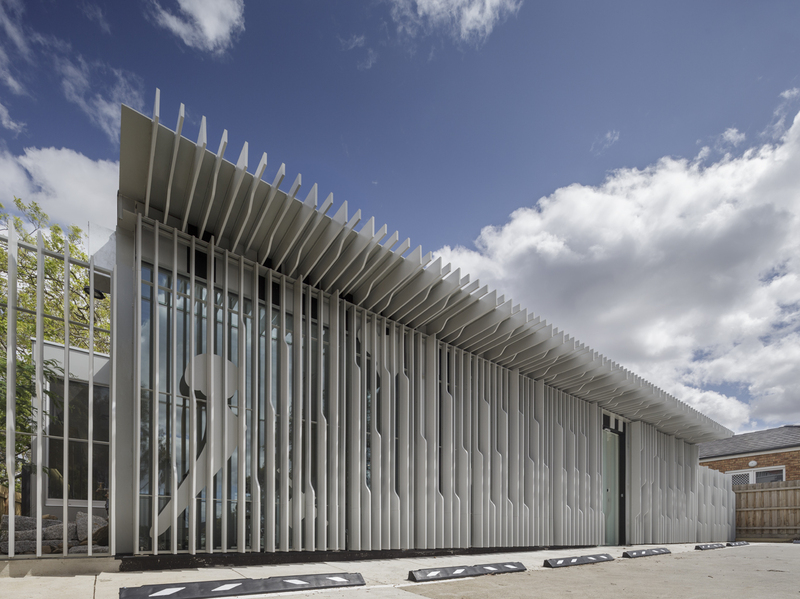 The façade emphasises the thinness of an X-ray sheet, while developing a depth through layering film, steel and recycled plastic forms. As it is backlit by the interior, the façade mimics the visual qualities of the X-ray on a lightbox. The interior extends the 3 dimensional qualities and interplay of light achieved in the façade. 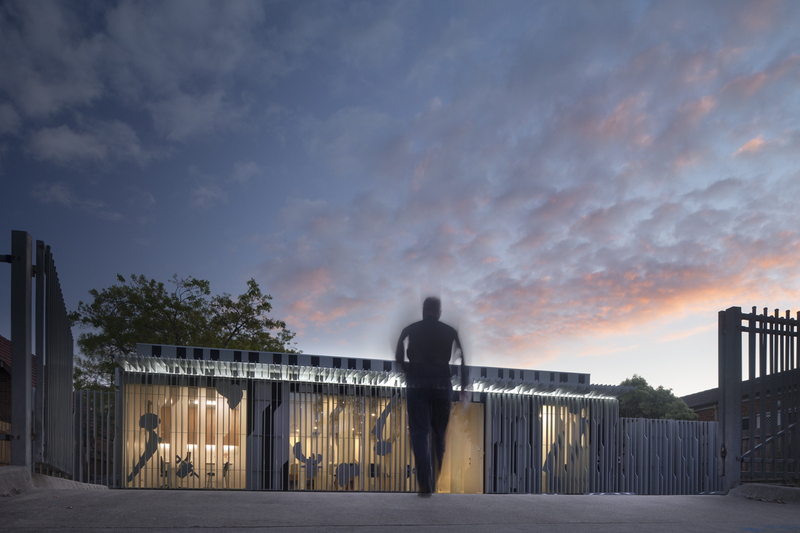 The recycled plastic acoustic panelling reinforces the shadows cast by the façade, extending the virtual world of the X-ray into the interior.The reception desk then develops the 3 dimensional qualities further by carving the prosthetics seen in the façade out of the layered plywood block. The carved elements removed are then connected to form the bench seat, ensuring all the plywood is used. 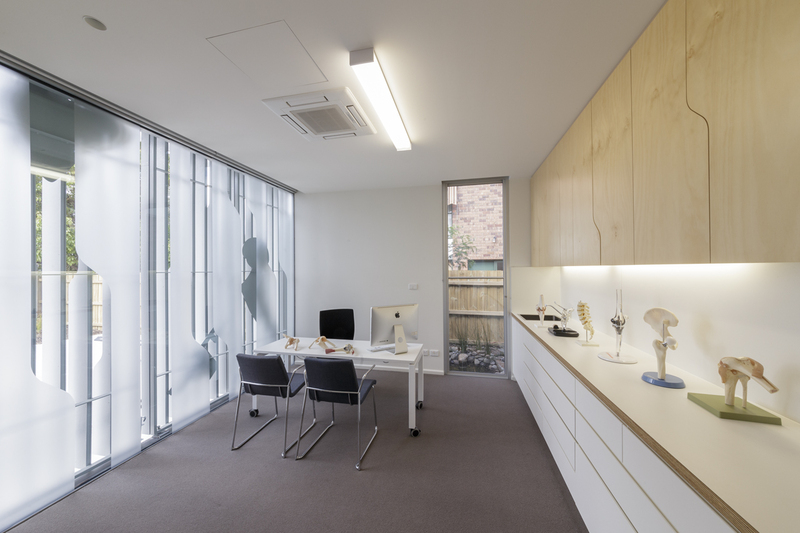 The new extension is highly sculptural while addressing the pragmatic requirements of the consulting rooms. In addition to this, the benefits of increased natural amenity have resulted in a greater sense of wellbeing by the staff and reduced services costs..